BBS1002- All PBL Cases Please read all of this description! This is my "summary" of all of the PBL cases we have had for BBS1002 (by summary, I mean it includes everything and is over 90 pages long). It is detailed, explains everything clearly (not just copying the weird language from some of the textbooks), and also touches on the basic anatomy and Autonomic Nervous system that we need to know. High levels of sassiness throughout, though most people seem to be enjoying the jokes. Personally, I find it easier to remember this way, but if you buy it and don't like the extra comments, there is a rewritten version that is purely the scientific information and I'm happy to send you that instead. All in English (Native speaker) but with effort to not use overly complicated language when it's not necessary. Summary BBS1002 Summary of the course BBS1002. Checked by the tutor and judged as a very good and complete summary of the course. Celbiologie en histologie A summary of the presentations and notes of all lectures from the section of cell biology and histology. Consisting of: structure and function of the cell and cell cycle 1,2,3, celcytochemie, intercellular communications, methods and techniques, muscle, nerve tissue, epithelial and connective tissues, gastrointestinal system and glands. Anatomy & Physiology: 10th Edition- Chapter 2 Outline This is a detailed outline of chapter 2 in this textbook listed. 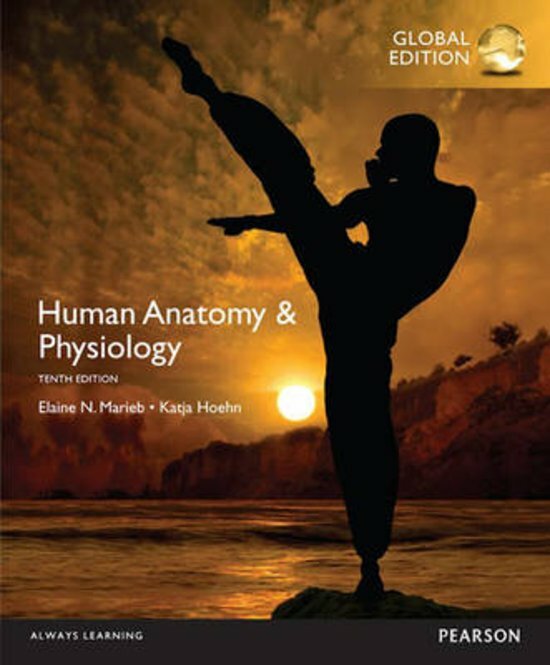 On this page you find summaries, notes, study guides and many more for the study book Human Anatomy & Physiology, written by Elaine N. Marieb & Katja N. Hoehn. The summaries are written by students themselves, which gives you the best possible insight into what is important to study about this book. Subjects like BBS1002, superior, axial, Biomedical science, Cases, Homeostasis, Homeostasis and Organs & Human anatomy & physiology will be dealt with.